Bad News #1 - Southern Camera in Melbourne called that they had received the package from Canon and a note that they could NOT repair it. The parts and labor would cost more than a new camera. I asked the price of a new camera and, of course, the one like mine (2 years old) isn't being made any more so I would have to upgrade to one out of my price range. Good News - An internet search turned up exactly my camera NEW through Amazon.com and to Cameta Camera in New York. I sucked it up and paid. It will have a basic lens, but I will have to wait 3 more weeks for my daughter to bring my other lenses down here to me so...bought it. Bad News #2 - I checked the mailing confirmation when it arrived in my email inbox and discovered that the camera was being mailed to the Michigan address. MY MISTAKE, probably. I called UPS and found the package hadn't been picked up yet. Promptly at 9 the next morning I called Cameta Camera. The lady checked for me and said the parcel had been picked up at 4 AM. They could call UPS, have it brought back, and ship it to the right address. BUT they would have to charge me two more shipping fees. I decided to let the camera go on to the house in Michigan. My son will grab it as soon as it is delivered, take it across the street to my Step-son who will give it to his buddy's wife who works for UPS and she will reship it to me. I might have it by next Friday. We have had some young Sand Hill Cranes hanging about last winter and this. We wondered where they went when they matured because adults were just not here. The young ones are loud LOUD! They keep up their squaking even at night, making sleep with the windows open iffy. Today while I was wandering around lookng at plants, there was an unfamiliar call coming from the sky. As I looked up I recognized the softer sound of an adult Sand Hill. It was circling and calling in circles that came closer and closer to the lake. Finally there was an answering call from the lake and the flying bird widened its circle and landed somewhere in the vacinity of the lake. I heard no more. An hour or more later, I was searching for turtles on the little beaches across the bay. Woa! Suddenly I was staring at two adult Sand Hills. I grabbed my little Canon Powershot ELPH and went all the way down to the seawall without upsetting the pair. My favorite shot is above. Now I can only hope they decide to nest near us. "On March 14th, 1903, the dream of one man with a boat became reality. Sebastian resident, Paul Kroegel, had fought hard to protect the birds of Pelican Island from relentless "feather seekers". Through Paul's vision and the help of many friends one hundred years ago, President Theodore Roosevelt declared Pelican Island to be America's First National Wildlife Refuge." Pelican Island Wildlife Preserve Website. A President Roosevelt re-enactor spoke to the crowd and wandered among us answering questions. That certainly brought the festival to life. As we sat down to watch the wildlife presentation, it started to rain...the first we have had since the first of February. Although the birds and reptiles didn't seem to mind, the human audience scattered for shelter. It didn't last long and the festivities continued. This gorgeous eagle was pushed out of the nest by a greedy sibling and was found with a broken wing. He will never be able to return to the wild, but probably will have a long good life educating us on these fascinating raptors. Later in the afternoon, after dinner with dear friends, we checked out the two county beaches along A1A. They were badly damaged by the hurricanes of '04, but are rebuilt bigger and better than before. I can't wait to take the kiddies there during their Easter vacation. Yesterday we noticed a very large and very dead fish in the lake near the seawall. It took a bit but finally today one of our friends positively identified it as a Gar Pike. This is a fish we do NOT want in the lake. It will take take food of the game fish and worse if left to breed. Where did it come from? Most of the fish were killed 2 summers ago with an algae bloom. If the DNR restocked the lake they certainly would NOT have introduced Gar Pike! My son-in-law, who teaches Aqua-Science /Agri-science suggested that the fish might have been dropped by one of the Osprey or Eagles as it flew over the lake. Maybe. Later in the day the vultures found the fish, but just didn't have what it took to jump into the inches deep water to feed. It was funny, though, to see them pacing back and forth wanting SO badly to feed. When all is said and done, the dozens of turtles and the other fish will probably finish the remains of the Gar Pike within the next few days. While I was still climbing into my sweats in the bedroom I could hear the "laugh" of the Pileated Woodpecker out the window. This is the longest one has stuck around. For the last couple of days I have heard him here and there but haven't seen him again. I hope he is still around when I get my DSLR camera back (maybe Monday). Then I opened a can of sardines for the gorgeous big white Egret in his mating plumage. I can see why they were almost extinct for those long tail feathers (for m'lady's hat, I read). Someone asked me if the Egret and Stork will eat out of my hand. I have no idea! I am more afraid of those long sharp beaks than they are of me. I am perfectly happy to set the sardines on a paper plate on the seawall and just watch from a safe distance...about 10 feet. As I sat down on the patio with my bowl of Cheerios, I noticed a pair of grey squirrels playing about. They certainly are not unusual. In fact they can become quite the pest like they are in the city park. Several companies advertise that they wil rid you of these "pests". However, they are new in this neighborhood and I like them so I put out a bowl of cherrios for them. They are smaller than the FOx squirrels up North. Their fur looks softer, grey with a white belly and throat and white around the eyes. Makes them look SO sweet, but I know better. Then I had to dip an enormous spider out of the pool and "encourage" her to take up residence elsewhere. Well, the wildlife can't be ALL cute! 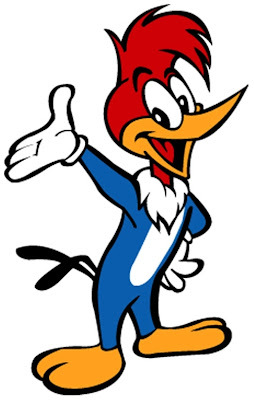 All you have to do is listen to this bird to know where the inspiration for the cheeky cartoon character originated. We saw our first Pileated Woodpecker the first year we came to Florida, 2002. It was on a palm between the lake and the house. We have only seen this bird a handful of times. Yesterday evening, while sitting by the lake and chatting with a neighbor, we heard the distinctive "laugh". In no time we spotted him on a dead orange tree two houses away. A convenient clump of palm hid me while I snapped a couple of pictures. How I wished for my Digital SLR (still in the shop being cleaned of sand and water) and my 300mm lens (gone forever). But, for a little purse Canon I didn't think the ELPH Powershot did a bad job. White in wings, at base of primaries, and underwing linings. White conspicuous in flight; at rest shows only as small white spot at front of wing. Black and white stripes on face. White stripe extending from base of bill down neck. White stripe above eye and below crown. Bill thick and silvery gray. Legs and feet grayish black. I shouldn't feel badly about usingmy second camera. It is a NICE Canon PowerShot ELPH and has a lot of nice features. I am reading through the users guide and learning. It just doesn't seem right not putting it up to my eye. Here are a few shots I have taken in the last couple of days. I received a phone call from Sigma, the manufacturer of my 27mm-300mm lens. It would cost more in parts and labor to repair it than to buy a new one. The camera shop in Melbourne (Southern Camera) has not heard from Canon yet but should by tomorrow. It has been more than 10 days since they sent it in to the factory. We went bumming around yesterday, including a visit to a pawn / gun shop. I asked to see the lenses in the showcase (3) and discovered one was a Canon. It was the basic lens that usually comes on the DSL but, the cheapest I could find was $89 on sale. They wanted $20 for this one and I couldn't find a mark on it. ...and I got them to throw in the Canon battery sitting there. The battery appears to be fully charged and functional. Now, at least I will be able to use the camera IF I get it back repaired. There are 3 more lenses back in Michigan with my daughter's camera. We both have Canon Rebel film SLRs, but they will probably never be used again. So...I will have lenses although not like the one that took a swim. Meanwhile, I will be saving up for a similar lens to the drowned one...WITH the stabilization technology. Yesterday late morning I strolled out onto the patio to check the greenery, the weather, and the lake. There, on the North side of the pool was a curvy streak of BLACK. A SNAKE. When I was teaching I tried to be the FIRST to bring a snake into the classroom each spring. That usually stopped the jokesters from trying to scare me. If I am in control, snakes don't bother me, but I don't like being surprised. I would never show shock or fear in front of the children so I overcame a natural aversion to snakes. I came in and told the Old Dear, hoping he would be the hero. I also grabbed the Audubon book on Florida. One black snake was all black and the "better" one has white or cream under the chin. WHAT? I am going to look??? Ok...I grabbed the binoculars just in time to see the snake slither through a crack and into the curbing around the pool. I know there are a couple of Anoles that hide there...or were. Bu the time the Old Dear appeared with a 5-gallon covered (empty) bucket and the Delux Gopher Pick-up and Reacher tool the snake's head was coming out from the crack. AHA! Cream under the chin. A Racer (coluber constrictor) CONSTRICTOR??? In case I wasn't sure, the book mentions the habit it has of holding his head up. Once the snake was completely out the OD stepped between it and the pool. As he worked to pick it up with the "Gopher" that snake got MAD! He was vibrating his tail like a rattler (but no rattles). Finally the snake was IN the bucket and the lid firmly on. My OD took it WAYYYY down the road and let it go into the brush. I am not crazy about snakes, especially on the patio or in the house (like that first week we were here this year) but I wil not allow them to be killed.